Tag line: "What began in Hell, will end on Earth"
Any movie set to follow the brilliant one-two punch of Hellraiser and Hellbound: Hellraiser II was bound to be a disappointment, yet even this realization didn’t adequately prepare me for the debacle that was Hellraiser III: Hell on Earth. 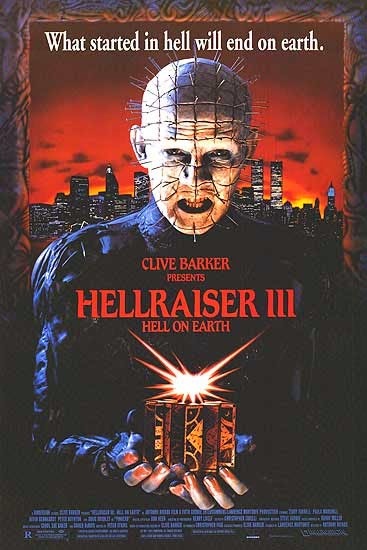 A limp, uninspired mess, Hellraiser III lacked the imagination that made the first two movies so enjoyable, taking what had been a fascinating story and turning it into a boring cliché. After rediscovering his humanity (see Hellbound: Hellraiser II), Pinhead (Doug Bradley) splits into two distinct personalities: his former self, a World War One-era British Officer; and the Cenobite Pinhead, which, as a result of this fissure, is trapped inside the Pillar of Souls, a statue that’s eventually purchased by night club owner J.P. Monroe (Kevin Bernhardt). At the same time, fledgling TV news reporter Joanna “Joey” Summerskill (Terry Farrell) is searching for a story that will help get her career on track, which she finds when one of the patrons of J.P.’s club is killed under mysterious circumstances. Aided by Terri (Paula Marshall), J.P.’s former girlfriend, Joey manages to uncover the story of a lifetime, but will she survive long enough to tell it? Hellraiser III: Hell on Earth fails to deliver on almost every level, and has more than its share of missed opportunities (early on, Joey is at a hospital trying to dig up a story when, all of a sudden, things grow very still, at which point a nurse begins pulling some frightening-looking instruments out of a drawer. Yet what at first appears to be a set-up for an otherworldly encounter takes a much different, and quite frustrating, turn). Even more bothersome is the way Hellraiser III churns out Cenobites. In Hellbound: Hellraiser II, we witnessed the creation of a new Cenobite, which, from what we could gather, was an “honor” reserved only for the truly evil. By the time Hellraiser III is over, nearly every character killed during the course of the movie is transformed into one of Hell's servants, each more bland than the next (one guy, who used to be a DJ, changes into a Cenobite whose only “feature” is the music CD lodged in his head). But for me, the movie’s biggest problem is the way it handles the character of Pinhead. By splitting him into two people: one good (his human form) and the other bad (the Cenobite persona), Hellraiser III gives us a watered down version of Pinhead, less effective than he was in the previous films. What made the character so intensely disturbing in Hellraiser and Hellbound: Hellraiser II wasn’t his demonic nature, but his indifference; whenever he appeared, it was because he was “called” (i.e., someone opened the puzzle box). He didn’t hate his victims. In fact, he had no feelings towards them whatsoever. It was simply his job to collect a soul and drag it to hell, and the cold demeanor with which he and the other Cenobites approached that task made it all the more terrifying to watch. In Hellraiser III, Pinhead, having been separated from his human half, is reduced to a typical movie monster, a deceitful entity resorting to lies and threats to lure in a potential victim. Hell, he even spouts off a few one-liners along the way (when J.P., after getting his first glimpse of Pinhead, yells out “Jesus Christ!”, Pinhead replies, tongue firmly in cheek, “Not quite”). Aside from his behavior, Pinhead is also ineffective when staging an attack. In one scene, Joey is running down the middle of an abandoned city street, trying to get away from Pinhead, who’s following closely behind. How does he attempt to stop her? By making the cars along the side of the road explode into flames. For a character with the awesome power of hell at his disposal, this is a pretty feeble offensive (Stallone’s Rambo could have caused more damage). Hellraiser III did feature one interesting idea: the Pillar of Souls, a statue depicting the faces of those taken to hell, each twisted and deformed as a result of their suffering, with Pinhead himself as the sculpture’s central figure (the film’s best scene involves a poor girl being pulled into the statue, her face frozen in mid-scream as she becomes one with it). Aside from this, Hellraiser III: Hell on Earth is, in every way imaginable, a step down from the first two entries.